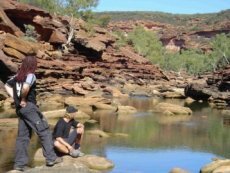 Aussie Outback Safaris and Red Earth Safaris are dedicated to the goal of ensuring that our Pinnacles, Monkey Mia and Ningaloo tour guests have the unique, quality experience they seek, whilst also having plenty of fun and adventure along the way. As a small owner operated tour company we can ensure that the standard never slips. 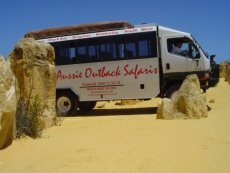 The owners are regularly on tour, and our other regular driver, Trevor, is just about THE most experienced driver and guide in Western Australia. 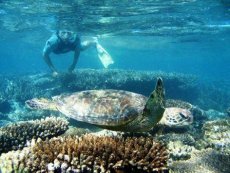 We repeatedly hear guests on our Shark Bay and Ningaloo Reef tours, say that this made a huge difference. For us this is excellent as our passengers then become our best marketing tool. Yes, we have a high focus on providing fun and adventure. Yet rest assured, we are equally focused on our guests' safety. That is something we would never compromise. Our vehicles are always meticulously maintained. Your driver and guides are owner operators Terry Ramsey, Paul Heyes and also legendary guide Trevor Booth, rated as the best Tour Guide Chef on the West Coast of Australia. Their knowledge of the Shark Bay region, and the Exmouth peninsula, is built on over 40 years of combined experience. which means we are always ready to take advantage of any unexpected opportunity or spectacle. (Incidentally, Trevor's legendary status was further enhanced by a glowing review in one of the UK's Glossy Sunday Supplements late in 2008). The thing is, we are not just working for a salary.... we are working to give you the best tour ever and thus make you a walking, talking advertisement for Aussie Outback Safaris Monkey Mia adventure tours, and Red Earth Safaris Ningaloo Exmouth tours. We suppose we should warn you, each tour is different .... if you don't like surprises you may be more comfortable with a different tour operator. We go out of our way to spring pleasant surprises on our guests. We reckon it's all part of having a great time. Have we mentioned photography? Whatever you do, don't leave your camera behind. You're in for some scenic treats and you'll be sorry if you can't show your friends what you did on your holiday. For example: the Australian outback light; the West Australian icon, the Pinnacles; the dolphins of Monkey Mia; the vivid colours of the Kalbarri gorges, and the Shark Bay region - are all especially photogenic, and yet the best is still to come - one of the most photogenic beaches in the world - Turquoise Bay, scene of the Elle McPherson iconic WA tourism ad. Your pictures will not merely be good holiday snaps, but quality photographs in their own right. To see the spiritual effect the Monkey Mia dolphins of Shark Bay have on so many people is also a once in a lifetime "Kodak" moment. The emotions of young and old alike, as a result of their interaction with the Monkey Mia dolphins, is a moment that just has to be captured forever! This section would not be complete if we didn't mention the camaraderie which seems to automatically develop on every tour. The highlight for many being the night spent around the fire, under the stars at the Outback camp. Giving our tour guests a really great time is precisely how we have grown the reputation of our business, now featured in the Lonely Planet Guide. And we do not intend to rest on our laurels. 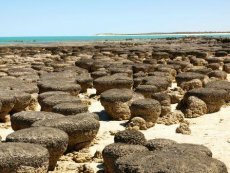 Every Pinnacles/Monkey Mia/Exmouth Ningaloo tour is its own new challenge. How can we make this trip the best one ever? 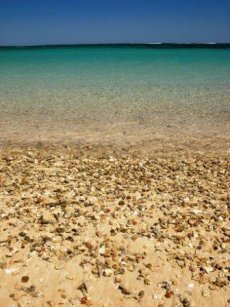 Whether you are on a short Pinnacles Tour, or an extended Exmouth - Ningaloo Tour, we will ask you to write a comment in our Guest Book. Take a look at a tiny selection of samples. On any page of our guest book, on any tour, we could pick any of the comments to sell our tour.